The Insurance Pad is the ultimate heat shield. Use wet or dry, where higher temperature protection and prolonged use is required. Great for use with acetylene air torches. 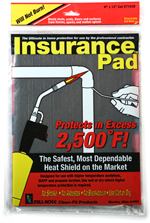 The Insurance Pad delivers protection in excess of 2500°F, an incredible improvement over ceramic and fiberglass heat shields on the market. 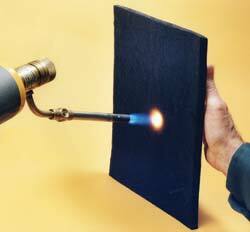 The Insurance Pad® is a fibrous-felt heat shield with the safest specs in the industry. Repeated use actually increases its heat resistance. Fibers in this heat shield take on graphite qualities when exposed to flame, increasing its heat resistance. Attractive point-of-sale packaging builds sales, plus zip-lock bag (9" x 12" size only) provides added protection when not in use! 71036 6" x 9" Display Pkg. 10 1.0 lbs. 71038 9" x 12" Display Pkg. 10 1.8 lbs.